Brass wires used for wire EDM machines are described as being "coated" when they are covered with materials such as zinc and copper. Coated EDM wires are able to significantly increase the cutting speed. To coat the brass wires, we use innovative equipment that achieves fast yet precise results. 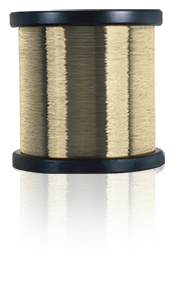 Coated brass wires are incredibly easy to use, are effective, give a good finish, and save energy - which means money savings too. Our product range includes the very best coated wires, along with their technical specifications and instructions. Our catalogue contains micro brass wires that have been coated using vapour deposition techniques. You will also find a vast array of products classified by spool size, weight in kilogrammes, and diameter. Copper wire treated by a new micro-molding process by CUWO deposition.